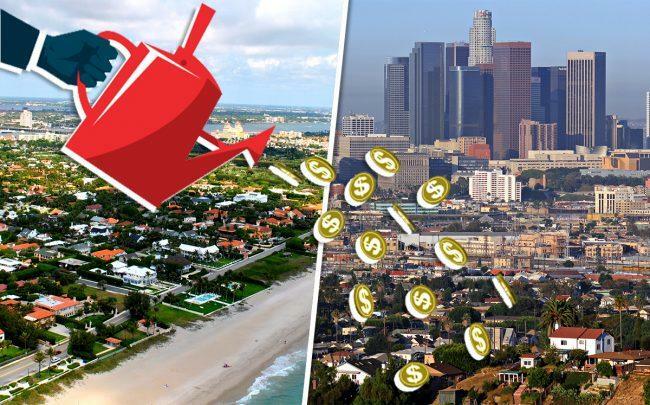 Real estate investors and developers are raising hundreds of millions of dollars for projects in the thousands of Opportunity Zones scattered around the country. But not all areas offer the best return for investors. With that in mind, what are the top counties in the U.S. for Opportunity Zone investment? No. 1 is…Travis County, Texas, according to a new report by Commercial Cafe. With about 1.2 million residents, the area — which includes Austin — ranked first among the top 306 Opportunity Zone counties surveyed in the report. Coming in at No. 2 was Sacramento, Calif., and No. 3, was Washington, D.C.
Los Angeles ranked 30th, while Miami-Dade came in 59th, Chicago’s Cook County was 109th and New York County was way down the list at 129th. To determine the ranking, the report factored in employment, Gross Domestic Product, population growth, poverty rates, and education level of the labor force. So, Travis was No. 1 for its relatively high weekly income —$1,226 — low cost of living and growing population, according to the report. The data highlights a major point made by developers and Opportunity Zones experts: not all zones are created equal. State governors were allowed to nominate about a quarter of all eligible Opportunity Zone tracts when the program was being designed in 2017. The majority of these zones were required to have an average poverty rate of 20 percent, and a median family income of no more than 80 percent of the statewide median income. The lack of equity of how governors selected these zones, however, has raised skepticism as to whether the program will actually incentivize investment in low-income areas. or will investment instead go toward up and coming areas that are already seeing new development. In South Florida, Palm Beach County —ranked 24th — is attractive for investors partly because there is a significant amount of development going on. The area has some pockets of poverty, but also has extreme wealth nearby in Palm Beach and West Palm Beach. Some of the Opportunity Zone sites in the county are already undergoing massive redevelopment such as parts of in Delray Beach. The federal government is trying to push developers to invest in affordable housing in Opportunity Zones. Housing and Urban Development Secretary Ben Carson recently told The Real Deal that the agency will give preference to developers who build affordable housing in Opportunity Zones. HUD, however, cannot mandate affordable housing, Carson said. The Opportunity Zones program, pushed forward in the tax overhaul plan of late 2017, allows developers and investors to defer and possibly forgo paying capital gains taxes if they invest in historically distressed areas. The biggest tax advantage goes to developers or investors who hold the properties for at least 10 years. Those developers and investors are now awaiting a second round of regulations from the U.S. Treasury and the IRS before deploying capital into Opportunity Zones projects. Some have already started to buy properties. In recent months, firms have launched numerous Opportunity Zones funds targeting hundreds of millions of dollars. Some of those companies include Youngwoo & Associates, Fundrise, RXR Realty and EJF Capital.